Agents use the SW Florida Multiple Listing Service (MLS) to search for homes for their buyers but what about searching for buyers for agent’s listings? The Ellis Team has found that having a searchable buyers database helps sell homes. There is no MLS for buyers. That would be weird. There is one for sellers but it does not include personal information like seller’s name, phone number, email address, search preferences, etc. because nobody would want that kind of information out to the public. The same is true for buyers. No buyer would want a seller searching and contacting them. And it wouldn’t be just sellers. You’d have every retail store, financial planner, lender, etc. calling these buyers if that data were out in the public. There may never be a true MLS for buyers as buyers for the reasons stated above however, we do have a large database of buyers we can search upon when we list new properties. One of the advantages we offer buyers is our MLS search site is updated every 5 minutes, so they can beat out other buyers to hot new properties. It’s also consumer friendly, speedy, and easy to use. Because the buyers benefit so much we’re able to capture crucial search data. The system will email them property matches if they desire, and they can target exactly what they’re looking for. Sellers often ask us if we have buyers looking for a home like theirs. The answer is usually yes. We can go into our database and search for buyers that matches our seller’s criteria. We spend a lot of money on advertising each month. We create a lot of buyers. It’s possible the money we spent last month or 6 months ago has already created a buyer looking for a home just like the one we’re listing. One of our databases has created about 1,407 leads in the past year. Let’s say we’re on a listing appointment and the property is worth $250,000. If I search our database, we currently have 304 leads searching in that $250,000 range. Let’s say we’re listing a Million dollar property. 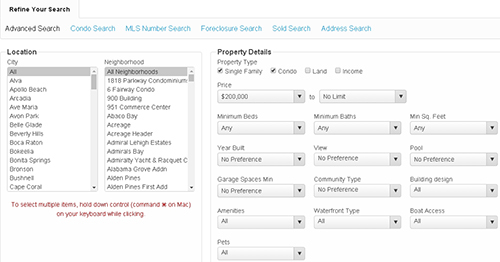 I just conducted a search and our database contains 58 people searching for properties. Our agents can tag buyers, so we have the ability to pin it down to features like golf course or waterfront, or neighborhoods. Each time we list a property we create marketing designed to find a buyer in that price range. It does us no good to list a Million dollar home and create $200,000 buyers. Our marketing never stops working. Not only are we marketing today for a million dollar buyer, our past marketing may have already created the buyer. Likewise, just because we didn’t have a $4 Million dollar home for sale in last 6 months doesn’t mean we don’t have some $4 Million buyers waiting for the right property to enter the market. We create marketing for what we list. If we list a $70,000 condo we’ll create some $70,000 buyers. Each week we have a team meeting and we inform our agents the properties we’re listing soon. Many times we have a buyer waiting for one like that to come to market. I remember a few years ago we listed a property in Moody River Estates. The seller asked me if we had buyers for his home. I answered I don’t know, we could. I went back to office and sure enough, one of our agents was writing an offer on another property a street over from the one we just listed. I asked him to hold up and go show our home. A day later our home was under contract with a buyer we already had. No agent can promise you they have a buyer. And even if they did, you don’t know what the buyer will pay or how they will like it. The goal is to produce many buyers for the home. If you’d like to check out our site go to www.LeeCountyOnline.com Buyers and sellers love the site. Or call us at 239-489-4042 We’d love to help you buy or sell your piece of paradise in SW Florida. Today we have some good news to report on how the domino effect will help real estate market here in SW Florida and nationwide. For years Realtors have complained that financing was not as easy to obtain for condominiums as it is for single family homes. For various reasons FHA would not lend in most condo projects unless the association jumped through exhaustive and costly hoops. I’m sure FHA had good intentions and wants to protect consumers and the government, but the hoops were so burdensome and arduous that condos could only be financed by FNMA or Freddie Mac secured loans. While FNMA has 3-5% down loans, many buyers prefer using FHA financing and were forced to buy single family homes under this program. This all changed now that H.R. 3700 was signed into law this past week. More than 140,000 Realtors lobbied Congress in support of this bill and it passed the House and Senate with Unanimous votes. Imagine getting anything done in Congress with unanimous votes! Many argue that first time home buyers do well in condominiums because the budgeting for repairs, lawn, maintenance, roofs, etc are often times built-into the condo association fee. Homeowners are sometimes surprised by unexpected expenses that come with owning your own home. So this new law will really help spur first time home buyers to buy condos that are often times more affordable than single family homes. What this legislation does is create a domino effect which could really help the real estate market. By opening up the condo market to more buyers you free up those current condo owners to sell and buy other things. And prices could go up as there will be more demand for condos going forward. Getting more people into home ownership has its advantages, and financing is always key to providing a healthy real estate market and economy. What really hurt the real estate market and overall economy back in 2006-2011 was banks over-tightening lending practices. Changes needed to be made because loans like the “Liar Loans” and no documentation loans that President Clinton initiated to open up financing to minorities created a monster and the real estate crisis. What started with good intentions led to everyone getting free money with no documentation and we all know what followed years later. Now we have Dodd-Frank which is equally disastrous and overly regulatory and caused many homeowners to not be able to live the American dream. So wins like H.R. 3700 becoming law loom large and are good for the real estate market and economy. If it were me I’d repeal Dodd-Frank but you can’t just undo that without having a plan in place. I’d also undo Obama Care, but again you can’t just undo something without having a better plan to go into place. Since I’m a nobody my ideas don’t matter. And some would argue they like Obama Care. Where there seems to be unanimous agreement is in this bill, and to that end we’re all grateful. FHA’s owner-occupancy requirement has been cut from 50% to 35% and transfer fees will be more tolerated under this new law. These two new rules alone will open up more condos for financing, and the hoops they must jump through will be lessened. If you’d like to search for condos in SW Florida, you can do so at www.LeeCountyOnline.com Or you can call us at 239-489-4042 and our team can help you decide whether a home or condo may be the best choice for you. We have 2 units for sale in Bella Casa in Fort Myers. Passing of this legislation could help home values in Bella Casa and other condominium projects across SW Florida. 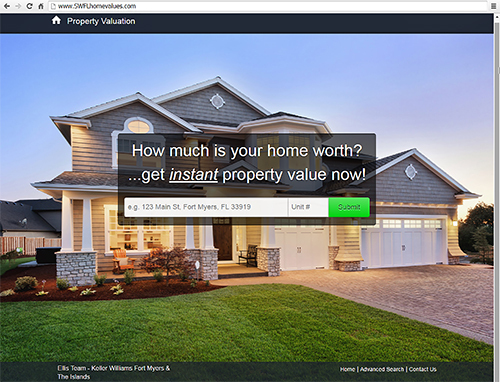 Find out what your SW Florida home is worth online. 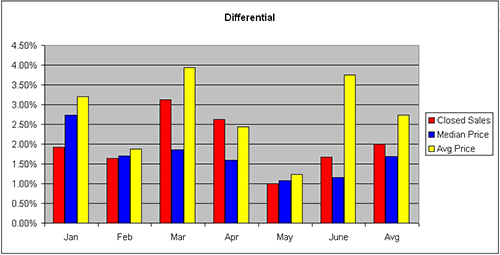 If you’d like a more detailed analysis, please call us and we can help. Posted in Bella Casa, Cape Coral, Cape Coral Real Estate, Fort Myers, Fort Myers Beach, Fort Myers Real Estate, Southwest Florida Real Estate. The problem with real estate agents is they are not all the same and it’s hard to tell the difference without really interviewing them. Agents come with varying experience and from differing backgrounds. There is no requirement for a college degree in Florida and it’s one of the few careers you can step into without any training. So what’s a consumer to do? The agent you hire does make a difference. Agents with vast experience and marketing can net sellers ten’s of thousands more at the closing table than agents with poor track records. Being locked into a listing agreement with the wrong agent can seem like a lifetime if there is no communication and little activity for your home. On the buying side, having an agent that works with you is invaluable. This is one reason most buyers do not buy For Sale By Owners. They want their agent advising them on price, inspections, zoning, schools, neighborhoods, etc. If a buyer is going to work directly with an owner they want a huge deal, because they feel like they’re taking a huge risk. The owner knows the home and neighborhood but the buyer doesn’t, so they feel at a disadvantage. One of the reasons a home owner might sell their own is to save the commission, but the buyer and the seller can’t both save the commission, so it rarely works. Even if they come together on price, the deal rarely closes due to other issues they’re not equipped to handle, like inspections, appraisals, financing, HOA rules, etc. I’ve seen two separate studies that show For Sale By Owners sell on average for 16% less with than an agent. This is not surprising. An owner desires to sell on their own only until they see the value of paying someone else to do it. When that occurs, it’s a no-brainer. After that, which agent is the best? Only 4% of all buyers can actually buy right now. Many buyers have to sell something first, so somebody has to solve that issue before they become an actual buyer today. Other buyers don’t qualify for financing right now. The answer is you need an agent that exposes your home to 100% of the market and can help with these facts about buyers. Imagine if you had an item on e-bay to sell. If there was just one buyer bidding on the item, how much would it sell for? Or, imagine you had 1,000 buyers bidding on that same item. Now how much would it sell for? The answer is, much more than just one buyer. And this is the difference between finding a buyer and 100% exposure. Since we know only 4% of all lookers can actually buy, we need as much exposure as possible. Not all agents advertise the same. Some agents don’t advertise at all. They employ the 3 P’s. Put a sign up, Place it in MLS, and Pray someone else sells it. The MLS doesn’t sell homes. Great agents do. If the MLS sold homes, all homes in MLS would sell, and that just doesn’t happen. Sellers need an agent who knows the market, communicates well, advertises extensively, studies changes in the market, and will tell the seller what they need to hear, not what they want to hear. The market rarely stays steady. It changes every year, every month, and by the week. Buyers need an agent that is familiar with financing, knows the market, and will show them homes that meet their criteria. The bottom line is buyers and sellers both need agents that can listen, communicate, negotiate, and help formulate a plan to accomplish a goal. The agent should have experience and wisdom, or access to it at all times. The Ellis Team at Keller Williams has all of this. Posted in Cape Coral, Cape Coral Real Estate, Fort Myers, Fort Myers Beach, Fort Myers Real Estate, Gated Community, Reflection Lakes, Southwest Florida Real Estate.